ii. The Cabinet has approved- Accession to WIPO (World Intellectual Property Organization) Copyright Treaty, 1996 and WIPO Performance and Phonograms Treaty, 1996- The approval is a step towards the objective laid in the National Intellectual Property Rights (IPR) Policy adopted by the Government on 12thMay 2016 which aims to get value for IPRs through commercialization by providing guidance and support to EPR owners about commercial opportunities of e-commerce through Internet and mobile platforms. i. The government has decided to sharply increase the Minimum Support Price (MSP) for Kharif crops, as it responds to concerns about distress in the country’s farm economy despite two years of strong monsoons. ii. The MSP for common variety paddy, the most important Kharif crop, will be raised by Rs 200 over last year’s Rs 1,550 per quintal. That works out a 13%t increase for the financial year ended March 2019 compared to a 5.4% increase in FY18. i. 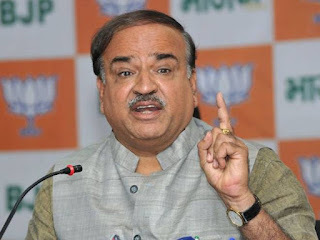 Union minister of chemicals and Fertilisers Ananth Kumar announced that the country’s first e-waste recycling unit will come up in Bengaluru, Karnataka. The unit is in keeping with the Swachh Bharat Abhiyan drive. ii. A 2016 study by Assocham and KPMG ranked India among the top five countries in e-waste generation, with an estimated 1.85 million tonnes generated annually. iii. According to the study, computers comprised 70% of the total e-waste and telecommunication equipment accounted for 12%. Bengaluru ranked third after Mumbai and Delhi and generated nearly 92,000 tonnes of e-waste annually. i. The Union Minister of State for Development of North Eastern Region (DoNER) Dr Jitendra Singh attended the famous 4-day Meghalaya Annual Cultural Festival, "Behdienkhlam", held every year at the small peripheral town of Jowai, Meghalaya. ii. On the concluding day of the festival, Dr Jitendra Singh spent time with the visitors from across the region who had come to attend the festival. · Meghalaya CM- Conrad Sangma, Governor- Ganga Prasad. i. NITI Aayog, in collaboration with various ministries and industry partners, is organising ‘MOVE: Global Mobility Summit’ in New Delhi in September 2018. This Summit will help drive Government’s goals for vehicle electrification, renewable energy integration and job growth and also speed up India’s transition to a clean energy economy. ii. PM Narendra Modi will be inaugurating the Summit, which will be the first Global Mobility Summit of its kind, with over 1,200 expected participants from across the world. The Summit will constitute three designated components – The Conclave, the Expo and the Featured Events. · NITI- National Institution for Transforming India. · NITI Aayog Vice-Chairman- Rajiv Kumar, CEO- Amitabh Kant. i. The Khadi and Village Industries Commission (KVIC) launched its, in-house developed,single-umbrella e-marketing system named Khadi Institution Management and Information System (KIMIS) in New Delhi. ii. This software will give real-time data of sales and will also give the updated status of stocks of khadi bhawans and godowns, allowing better planning and control of inventory of the KVIC. · Vinai Kumar Saxena is the present chairman of KVIC. i. The 5th Regional Comprehensive Economic Partnership (RCEP) Intersessional ministerial meeting was held in Tokyo, Japan. It was first RCEP ministerial gathering to be held outside ASEAN countries. ii. It was co-chaired by Singapore’s Minister of Trade and Industry Chan Chun Sing and his Japanese counterpart Hiroshige Seko. During the meeting, ministers from member countries had in-depth discussions on issues such as trade, service, investment and rules at the meeting. i. The Reserve Bank of India licensed Bank of China to operate in India. This decision comes as part of the commitment made by PM Modi to the Chinese leadership. Bank of China will now have operating offices in India. This will be the second Chinese bank to be operating in the country. ii. As on 1 January, 2018 Industrial & Commercial Bank of China Ltd was operating in India along with 45 other foreign banks. The United Kingdom’s Standard Chartered has the highest, 100 branches in India as of now. · Urjit Patel- 24th Governor of RBI, Headquarters- Mumbai, Established on- 1st April 1935, in Kolkata. · Bank of China (BOC) headquarters in Beijing. · BOC was formally established in February 1912. · Chen Siqing is the Chairman of BOC. i. NABARD has sanctioned Rs 735.53 crore in the first quarter of the current fiscal under the Rural Infrastructure Development Fund (RIDF) for West Bengal for facilitating the execution of 86 projects. ii. They include six solar power, one medium irrigation, five minor irrigation and 12 flood protection projects, besides 57 projects for the widening and strengthening of roads and five rural bridges. · NABARD stands for National Bank For Agriculture And Rural Development. · NABARD came into existence on 12 July 1982. · Headquarters- Mumbai, Chairman- Dr Harsh Kumar Bhanwala. i. Tony Award winner Liliane Montevecchi, the Paris-born dancer, actor, and singer, passed away at the age of 85 following a battle with colon cancer. ii. Born October 13, 1932, started her ballet studies when she was nine; by the time she was 18 she had joined Roland Petit's dance company, Les Ballets de Paris, where she eventually became a prima ballerina.